And it's a big step in the right direction. California became the first state to require all new homes to offset their electricity needs with solar energy earlier this month. And it’s planning to tackle emissions from public transit vehicles next. By the year 2029, all new mass transit buses in the whole state will have to be fully electric, according to a new rule adopted unanimously by the California Air Resources Board (CARB) yesterday — a powerful arm of the Californian government dedicated to maintaining healthy air quality since 1967. All mass transit bus fleets will have to be electric by 2040. “[A zero-emission public bus fleet] dramatically reduces tailpipe pollution from buses in low-income communities and provides multiple benefits especially for transit-dependent riders,” says CARB Chair Mary D. Nichols in an official statement. 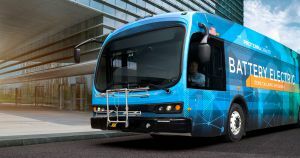 But there’s another advantage that could help motivate the roughly 200 mass transit agencies to adopt exclusively electric buses in the future: significant savings from switching from expensive gasoline to electricity. “Putting more zero-emission buses on our roads will also reduce energy consumption and greenhouse gases, and provides cost savings for transit agencies in the long run,” Nichols goes on to say. The move could massively reduce carbon emissions in the state, despite the fact that many of the largest transit agencies are already in the process of switching to electric buses — although, the transition has only begun. Only about 150 buses are electric out of 12,000 in the state, according to the New York Times. So far, the transition has been a little rough. The LA Times reports that many electric buses in California’s largest city are plagued by “stalls, stops, and breakdowns.” San Francisco city officials are worried that electric buses might not have enough oomph to get a full load of passengers up its famously steep hills. Despite these roadblocks, switching to exclusively electric buses has a ton of benefits — from cleaner air, much quieter streets, and savings in fuel costs.